Duke freshman basketball star Zion Williamson suffered a right knee injury during the televised Blue Devils versus North Carolina college basketball game. The injury happened a mere 36 seconds into the game as the 18-year-old appeared to lose his footing while dribbling the basketball and fell to the floor.Williamson was the presumptive #1 pick in the upcoming 2019 NBA draft. The television broadcast revealed that Williamson’s left Nike sneaker tore apart as he lay on the floor in visible pain, grabbing his knee. Williamson returned to the locker room, injured, and was out of the rest of the game. There are several possible legal implications of Williamson’s injury and its relation to the broken Nike sneaker. While it was reported to news media that Williamson suffered a mild strain to his knee - and, accordingly, he will likely recover - knee injuries sometimes prove to be stubborn, long-lasting, and vulnerable to re-injury. If Williamson’s injury turns out to be worse, or even career-ending, he may have a valid legal claim. First, it could be argued that Nike is liable for manufacturing a defective sneaker that resulted in his injury. This is because Nike, just like all other sneaker companies, owes a legal duty to market and sell footwear that is of reasonable quality for its intended purpose. A sneaker that falls apart - and was not tampered with or otherwise misused - is not merchantable. Evidence for the case can include the broken sneaker itself, the television broadcast, and eye witnesses who were at the game. Nike could likely argue that Williamson’s injury occurred independent of the sneaker and its destruction. Indeed, Williams bears the burden of proving his right knee injury was caused - both legally and actually - by the defective sneaker. Each side would likely hire expert witnesses to provide testimony in support of its case. Nike could also try to argue that either Williamson or Duke’s equipment staff inadvertently tampered with the sneaker, which resulted in it becoming less secure. The tampering and its end result, Nike would argue, was unforeseeable to the company. Nike could also call into question the condition of the floor where the game was played, at Cameron Indoor Stadium, and allege those conditions caused Williamson to slip. Personal injury and product liability cases involving defective shoes are neither new nor rare. A Connecticut woman received a six-figure settlement in 2017 from a shoe company after her heel twisted, causing her to fall and break her ankle. Likewise, a Florida court presided over a lawsuit in 2003 involving the parents of a minor child who suffered an infection to the bone and permanent heel damage after wearing a Nike shoe that allegedly contained metal. While Williamson’s injury was highly publicized, Americans suffer personal injuries every day. These may be caused by defective products or simply due to the negligence of another. 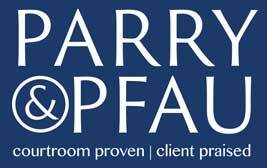 If you or someone you know has suffered a personal injury in Las Vegas due to a defective product or any other cause, contact the experienced attorneys at Parry & Pfau today. Our skilled attorneys can evaluate your case and fight for the monetary compensation to which you are entitled. The television broadcast revealed that Williamson’s left Nike sneaker tore apart as he lay on the floor in visible pain, grabbing his knee. While these walk-in tubs help alleviate the risk of tripping over the side of the tub when entering or exiting the bath, these products are not so useful when someone has fallen. Despite a government takeover of the management of the recall of Takata brand airbag inflators over three years ago, one third of the recalled items have yet to be replaced, according to a Las Vegas Review-Journal news report. Since 2017, more than 120 personal injury lawsuits were filed in courts after the battery in an e-cigarette exploded while in use and injured the vaper. When consumers purchase products, they reasonably expect that the products will function as promised. Countless motor vehicle accidents each year in Nevada involve a bad tire in some way. Samsung has been selling IEDs and marketing them as phones. If you have a Galaxy Note7, it's time to trade it in for something less volatile. If it's too late, what are your rights?